The Arcade, the historic covered shopping mall in Bristol’s Broadmead, is bucking the gloom in the retail sector by being fully let for the first time in nearly two decades. Occupiers of the 25 store units are predominantly independent and niche operators, continuing in the same vein as generations of tenants before them who helped make The Arcade a signature feature of Bristol shopping for almost 200 years. 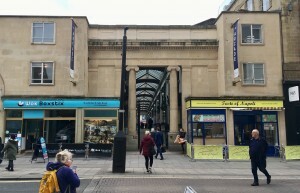 The most recent letting to local phone and computer repair company Techtock Mobile – its second branch in Bristol – means there is now no vacant space in The Arcade, which links Broadmead to The Horsefair. Stuart Williams, a director at Bristol retail agents Williams Gunter Hardwick, said that while many of the biggest names on the high street continued to consolidate or even go into administration, The Arcade was experiencing a ‘counter revolution in retail’ which was how retail blossomed in the city two centuries ago. “We’ve become used to chain stores or ‘multiples’ like M&S, Boots, New Look and Primark dominating our high streets,” he said. “They’ve dominated the scene for decades and – to be honest – we have reached the point where one retail centre is often very much like another. “But that’s not how it used to be at all. Shopping in London or Bristol, York or Bath would have been very different experiences. “Go back in time to the Georgian era, and we had just reached the point in our cultural history where consumer goods were becoming more readily available, shopping had started to become a popular social activity and people bought from individual traders that they knew personally and trusted. “People in Georgian Bristol would have shopped in The Arcade just like we do now… except the goods on offer were rather different. “Look at the popularity of The Arcade and some of our suburban retail centres – like Gloucester Road, North Street and Clifton Village – as well as the smart new leisure and food hotspots like Wapping Wharf and established venues such as St Nicholas Market – and you can see that many of us are now looking to spend our shopping and leisure pounds in a very different way than even a decade ago. Retailers in The Arcade include fashion, personalised art and greetings cards, milkshakes, coffee and cuisines from around the world, jewellery, travel, vaping and new age gifts. Services include a tailor, beauty/hairdressing, key cutting/heel bar and a tattoo shop. “One of the very welcome challenges we face as letting agents is that many tenants start here and then spread their wings to bigger premises elsewhere ” added Stuart Williams. “That ‘churn’ helps keep The Arcade interesting for shoppers as new names and retail offers keep popping up. “That said, for the moment, we have some stability where tenants complement one another and collectively provide a reason for shoppers to visit the most unique shopping street in central Bristol. Williams Gunter Hardwick acts jointly as letting agents with Cardiff-based Oscar Clarke.